Could Trump presidency create distance between US & UN? U.S. President-elect Donald Trump on Wednesday named Nikki Haley, governor of South Carolina and a former critic, as his choice for U.S. ambassador to the United Nations. "Governor Haley has a proven track record of bringing people together regardless of background or party affiliation to move critical policies forward for the betterment of her state and our country," said Trump in a statement. "She is also a proven dealmaker, and we look to be making plenty of deals. She will be a great leader representing us on the world stage," the statement said. It will be a Cabinet-level position, and Haley has accepted, Trump said in the statement. Haley supported Trump's rival Senator Marco Rubio of Florida during the Republican nomination race, and she was one of the most vocal critics of Trump early in his run. During the presidential campaign, Haley frequently called out Trump for his hard-line immigration policy, and also criticized Trump for refusing to release his tax returns. Only till the end of October did Haley announce that she would vote for Trump despite reservations about his character. Born to Indian immigrants in South Carolina in 1972, Haley is the first woman and visible minority to serve as governor of South Carolina. She is also the youngest current governor in the country. 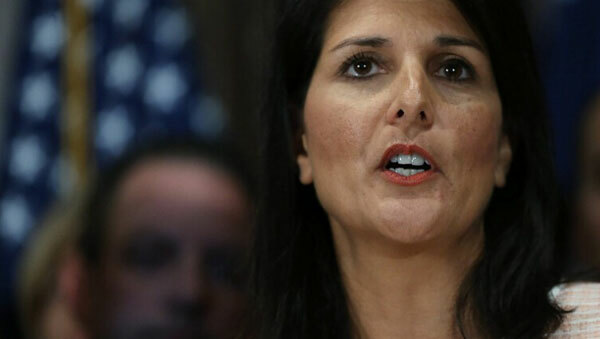 According to South Carolina's local daily The Post and Courier, Haley had little diplomatic experience before her nomination as one of the country's top diplomats.